Calgary Investors: Is it time to sell your rental property? A shift in the Calgary rental market has led a number of Calgary real estate investors to consider whether it’s time to sell their rental property. If you decide that it IS time, get the most from your investment by thoroughly cleaning, repairing, and professionally staging the unit prior to listing. I’ve heard from more Calgary real estate investors recently who have lost their renters. Low rental pricing, high vacancy rates, and job losses that are leading renters to move back home (either to other provinces or back in with their parents) are creating a bit of a lull. When you depend on that monthly rental cheque to cover the carrying costs on your investment condo, it’s no wonder investors are questioning whether it’s time to sell their rental property and move on to something else. As an investor, you’re always weighing your risks. I love working with investors with rental properties because they are committed to doing what needs to be done in order to gain the highest return on their investment. They want results and they want them fast. Garrison Green: This stylish and affordable townhouse already had quality finishings. Staging added the life it needed to get it SOLD. Sunset Ridge: Amazing mountain views were the highlight of this condo in Cochrane. Staging added the classy and peaceful feel that got it SOLD. Victoria Park: This downtown condo got a beautiful facelift. Staging highlighted those fresh features and added a trendy yet classy vibe that appealed to potential buyers in the area and got it SOLD. 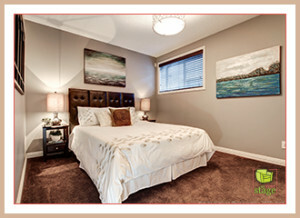 After: We used greens and earthy tones to complement the colours of this home. 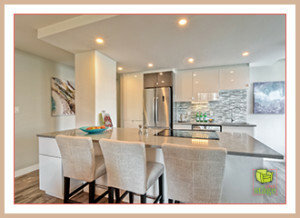 If you’re considering selling your Calgary rental property, I invite you to contact me to schedule your free, no pressure, personalized Home Staging Assessment today. Still curious? Read more about my work and reach out when you’re ready. Ask how the Set Your Stage team can help you meet YOUR Calgary real estate goals if it is indeed time to sell your rental property! This entry was posted on Monday, May 30th, 2016 at 1:23 PM	and is filed under Home Staging FAQ. You can follow any responses to this entry through the RSS 2.0 feed. You can skip to the end and leave a response. Pinging is currently not allowed.